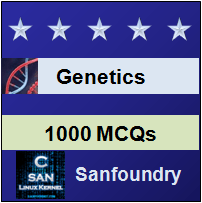 This set of Genetic Engineering Multiple Choice Questions & Answers (MCQs) focuses on “Purification of Plasmid DNA”. 1. Isolation of genomic DNA follows same principles as that of obtaining plasmid from E. coli. Which of the following is not included in it? Explanation: There are some basic steps which are included in obtaining plasmid DNA from E. coli. Firstly, the cell is lysed, further removal of proteins and chromosomal DNA is done. Plasmid is obtained and collected but not in water. Also, further purification is done if necessary. 2. How many methods are there for obtaining the plasmid DNA from the bacteria? Explanation: There are two methods which are used for obtaining the plasmid DNA from the bacteria. They are named as alkaline lysis method and boiling lysis method. They both are having different working principles. 3. Cell lysis is carried out by which substance? Explanation: Cell lysis is carried out by adding lysozyme and detergents. The cell wall is made up of N-acetyl glucoasamine and N-acetyl muramic acid and they are having cross links. The agents added break the cross links present between the molecules of the cell wall. Explanation: Chromosomal or genomic DNA is comparatively heavier and large in size than that of plasmid DNA. Hence, centrifuging at a high speed leads to settling down of the genomic DNA and thus can be separated easily. 5. Proteins can be removed via treatment by? Explanation: Proteins can be removed via treatment with phenol and chloroform treatment. Chloroform is alone not sufficient. The phenol added helps in destruction of proteins and chloroform helps in its dissolution under acidic conditions. 6. The nucleic acid remaining in the solution can be precipitated by addition of sodium or ammonium acetate and ethanol. Is the statement true or false? Explanation: The nucleic acid is present in the solution and is precipitated by addition of sodium or ammonium acetate and ethanol. It is because; nucleic acid is polar in nature and thus easily dissolves in water. Hence, to avoid this sodium acetate and ethanol is added. Sodium acetate is shields the charge present on the sugar phosphate backbone and further bonds are easily form between ethanol and phosphate. It leads to separating out of nucleic acids. Explanation: Nucleic acid precipitated contains of the plasmid DNA and along with it RNA and remnants of chromosomal DNA are also present. RNA can be removed via adding RNase. Explanation: Exonuclease leads to removal of remnants of chromosomal DNA because they are usually having linear ends. The circularized ends of plasmid are protected from the action of exonuclease because they don’t have any free ends for their action. Explanation: This method is used for separation of plasmid DNA. It is advantageous because it avoids the use of phenol and also removes RNA at times along with plasmid DNA. 10. Which of the following components bind to the solid column made of silica, under high salt concentration? Explanation: Plasmid DNA binds to solid support which is made of silica and under high salt concentrations. A high salt concentration doesn’t allow less polar molecules to bind such as polysaccharides and proteins. The binded DNA molecule is further eluted by using a low salt concentration. a) ion exchange resin based method. Explanation: Silica derivatized groups by DEAE are used for purification of DNA. These groups are positively charged and the DNA gets attached to it, along with other species such as RNA which are negatively charged. Further, DNA can be obtained by varying the ionic concentrations. 12. Which of the following is correct with respect to caesium chloride centrifugation? Explanation: Caesium chloride is heavy and when nucleic acid is dissolved with it, density gradients are formed. According to extent of supercoiling and G+C content, settling of DNA takes place. The nicked DNA settles above than the nicked DNA. 13. Which of the following components settles at the bottom? Explanation: The component settling at the bottom is RNA. And the proteins float on the free surface. The nicked DNA forms a band above the supercoiled form. Explanation: Ethidium bromide is added before centrifugation. It is an orange-red coloured stain which gives rosy coloured bands when placed under UV light. It acts upon by intercalating between the bases.